In the City Civil Court, Sri Amiya Vilas Swami and other followers of ISKCON Mumbai had claimed that they were the original founding members of ISKCON Bangalore Society (Regn. No. S.49/78-79). They had alleged that Sri Madhu Pandit Dasa and others had illegally taken over the society and were imposters. In an elaborate judgment running into several hundred pages, the Trial Court said that the claims of ISKCON Mumbai followers was legally untenable and dismissed their suit with costs. During the course of the trial, some of the followers of ISKCON Mumbai including Sri Amiya Vilas Swami and others withdrew from the suit. But the remaining followers of ISKCON Mumbai went on an appeal before the Honourable High Court of Karnataka. During the course of the appeal, some more followers of ISKCON Mumbai withdrew from the suit citing various reasons. Sri Prasannatma Das, a follower of ISKCON Mumbai was the lone appellant left for some considerable time. Recently, Sri Amiya Vilas Swami once again sought to impaled himself as an additional appellant. Today, the Honourable High Court dismissed his application and the entire appeal itself on merits. It may be recalled that ISKCON Mumbai is predominantly controlled by self-made Acharyas (not appointed by the Founder and Acharya of ISKCON, Srila Prabhupada). Although Srila Prabhupada had given a written institutional directive on how he shall continue to be the Acharya of the institution and his senior disciples shall act as Representative of the Acharya, soon after his passing away, his immediate followers usurped the position of Acharya in ISKCON. This has led to much abuse of powers, financial and moral corruption which is continuing even to this day all over the world. When Sri Madhu Pandit Dasa and other members of ISKCON Bangalore questioned ISKCON leaders in 1999 on these matters, ISKCON Mumbai and their agents and followers have been trying to oust Sri Madhu Pandit Dasa and others from the well-known ISKCON temple on Hare Krishna Hill, Rajajinagar, Bangalore. Devotees of ISKCON Bangalore following the written directives of ISKCON Founder-Acharya, Srila Prabhupada, adheres to the directive that Srila Prabhupada continues to remain the sole initiating Guru and Acharya of ISKCON; whereas ISKCON Mumbai seeks to appoint successors to Srila Prabhupada, who will act as Acharyas based on a no-objection voting system. In 1999, the followers of ISKCON Mumbai and their self-made Acharyas tried to physically storm the Temple on Hare Krishna Hill, which forced devotees of ISKCON Bangalore to file a suit seeking a permanent injunction of non-interference in its affairs against ISKCON Mumbai and its self-made gurus. 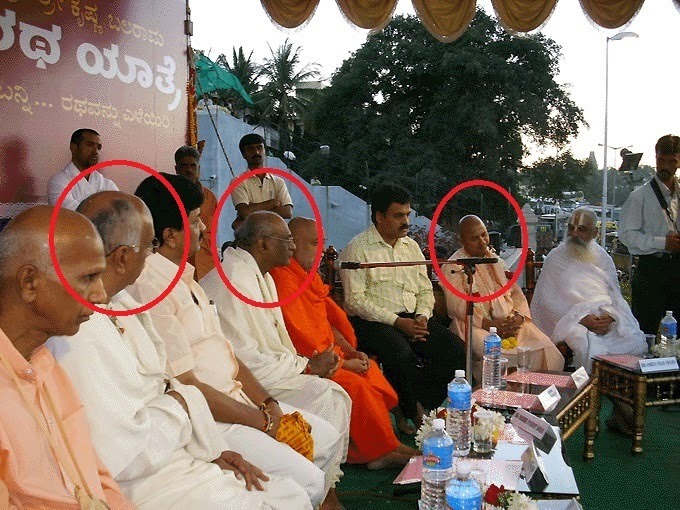 Finding that their authority was disturbed, the self-made gurus of ISKCON resorted to all kinds of unethical, political means to disturb the yeoman services rendered by the devotees of ISKCON Bangalore. One such attempt was filing of this frivolous suit through some followers of ISKCON Mumbai falsely claiming to vest control of the ISKCON Bangalore society (regn no S.49/78-79). The Honourable High Court’s verdict today ensured that these frivolous claims come to a naught.